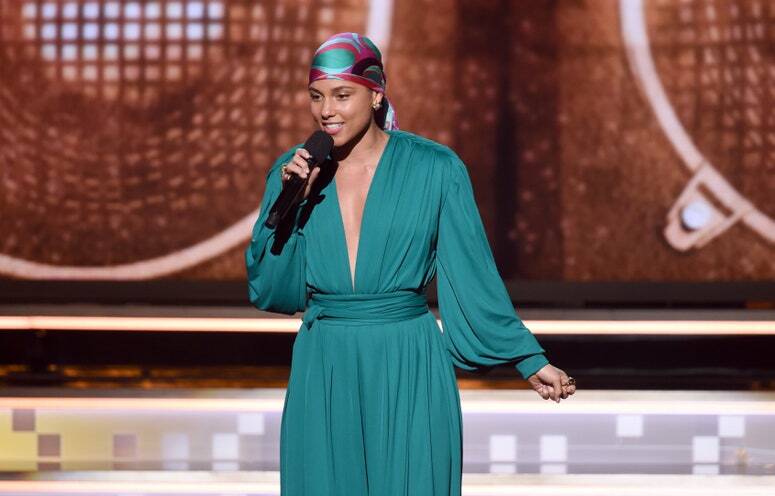 When Alicia Keys announced three years ago she was swearing off makeup, we cheered her on. Someone was finally pushing back at the absurd expectation that women in Hollywood need to spend hours in hair and makeup before leaving the house. We were also jealous. Not only does she have the voice of a goddess (and the ability to play two freaking pianos at once), she’s got skin like one too. But Keys is human, and it soon came out (thanks to some intrepid reporting by W) that like all that rehearsal time she spends in the studio, she puts the same amount of energy into her skin care routine. And according to her makeup artist, Dotti, that regimen goes to the tune of $455. So last night, when a little birdie alerted us to the fact Keys actually was wearing makeup to host the 2019 Grammys, we rang up Dotti immediately to find out how to do your makeup so convincing that it tricks hundreds of journalists to report you’re not wearing any. Unsurprisingly, it’s all about skin care prep. “We do quite a bit prep before we even get to makeup—we moisturizer, jade roller, and massage,” Dotti tells Glamour. “Prepping for the most important thing. You can put any makeup on top, but it’s about the quality of the skin you put it on that’ll really make it look great.” To get to that place, she says Keys does a lot of the things you can’t get at a bathroom sink, like lasers and facials (sorry), but she does have a solid trick for making the most of your skin care products. It’s all about layering. “I start with a light serum and moisturizer, just to keep the skin quality lush but not weighed down, and for each one, I roll it in with the jade roller, then do another layer,” she says. The same trick goes for making foundation look virtually undetectable—yes, even drugstore formulas. “I like to break down foundation by mixing it with face oil until it literally becomes translucent,” says Dotti, who used Burt’s Bees Full Coverage Liquid Makeup in Walnut and Deep Maple mixed with the brand’s Complete Nourishment Facial Oil on Keys last night. Then, just the way she layers skin care, she does the same with base makeup. She first presses foundation in with a big buffing brush (Rae Morris brushes are her favorite) or Beautyblender, then she rolls it with a jade roller. Next comes another layer of makeup, followed again by jade rolling. “It helps makeup sink into your skin for a more natural glow,” she says. “I think makeup looks best after an hour or two after it’s settled onto your face—this does that instantly. You’ll get makeup on your roller, sure, but that’s fine. It actually helps remove any excess.” As for the type of roller she recommends? Dotti got hers 10 years ago and doesn’t remember the brand, but she says investing in real jade (like one from Ling Skincare) is worth it.